They say you’re not supposed to be a hero, but it seems like somebody forgot to tell that to 31-year-old IT consultant Kevin Haskins, who recently sprang into action in a very big way. When he spotted a suspicious package on a train, he screamed and screamed and screamed. There was never a moment of hesitation. When Haskins witnessed someone leave a suspicious-looking suitcase under the seat, he immediately started wailing and sobbing. Taking complete control of the situation, Kevin screamed louder and louder and louder. With tears streaming down his face and snot pouring from his nose, Kevin screamed until everyone on the train knew he was screaming. 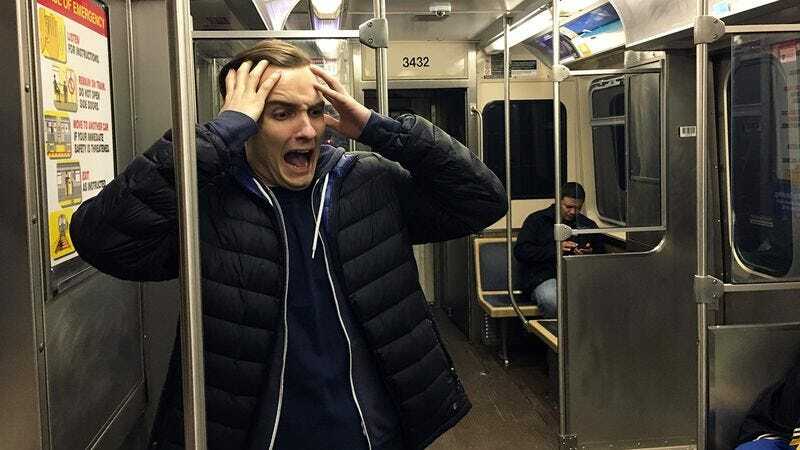 As stops continued and passengers came and went, Kevin stood his ground, totally inconsolable as he screamed himself hoarse and was reduced to making little terrified noises. Even once he’d completely lost his voice, this everyday hero’s wild display of panic never let up for a second. It’s frightening to think about where we’d be without good Samaritans like Kevin out there, but thanks to his lone act of bravery, public transportation seems a little bit safer today. Way to go, Kevin!